At the March 26 meeting of the 326th Student Assembly of the College of William and Mary, senators and representatives of the College’s Media Council discussed concerns over free press and censorship that ensued from a proposed bill to reduce Media Council’s reserve funding. The proposed Financial Regulatory Act, sponsored by Class of 2019 President Sikander Zakriya ’19 and Sen. Jessica Seidenberg ’19, places a threshold on Media Council reserves at $55,000 after the 328th Senate, or the 2020-2021 academic year. Debate was held among senators over whether the $55,000 figure should be imposed as a reserve ceiling or a reserve floor, but senators were unable to reach a conclusion over this threshold by the end of debate. After the renegotiation of the contract between Media Council Chair Sarah Smith ’19 and SA President Brendan Boylan ’19, Media Council reserves had already been reduced from $87,000 to $75,000 for the 2019-2020 academic year. Zakriya argued that the reduction of Media Council reserves in accordance with his proposed resolution would not drastically affect the Media Council’s funding capabilities. Zakriya stated that in years past, the Media Council had hardly dipped into reserves, with the highest spending amount — $34,000 — being incurred only following the flooding of WCWM in Campus Center this year. Smith raised concerns over the lack of communication between the resolution’s sponsors and representatives from the Media Council, believing that Media Council should have been included in discussions about changes to its reserves. Smith then discussed that when she presented to SA both in the fall and earlier this spring, she expressed genuine intent to foster a relationship between SA and Media Council. Smith felt that senators’ institutional knowledge, as well as their vibrant conversations on the senate floor, were all ways that SA could improve Media Council moving forward. However, Smith pointed out that SA had not completed its guaranteed promises to Media Council, and mentioned SA’s failure to appoint liaisons to the Media Council. Smith raised concerns over SA passing a bill that would affect the Media Council’s funding before senators worked on improving its relationship with Media Council. Smith also expressed her misgivings about the future of the free press at the College, and discussed the significant consequences that SA votes have on student organizations. Smith recalled a 2017 incident where several multicultural student organizations came forward to share with SA that they felt mistreated during SA’s annual funding analyzes due to senators’ lack of understanding about their respective organization. According to Smith, the lack of funding in 2017 stemmed from discriminatory processes within SA finance; while the discriminatory issues found with the EAC process were a central focus of candidates running for SA president in the 2017 SA elections. Smith wondered if the student press will encounter similar obstacles in the future. Boylan argued that reducing Media Council’s reserve funding was not an attack on the free press or free speech at the College, but that the resolution’s proposed shifting of monetary resources could be used to serve the student body more efficiently. Meanwhile, Class of 2020 President and SA President-elect Kelsey Vita ’20 and Class of 2021 President David DeMarco ’21 brought up the point that the Media Council was unaware of this bill until recently. DeMarco defended the importance of the Media Council and called SA’s own spending history into question. Aside from dialogue about Media Council funding, earlier in the meeting, Tara Clark ’20, Treasurer of the College’s chapter of Amnesty International, gave a presentation about the Refugees Welcome Resolution with support from Zakriya, Sen. Kyle Vasquez ’21 and Sen. Helen Tariku ’21. This resolution aims to make the College more accessible to refugees and asylum-seeking students. The Amnesty International chapter and senators plan to work with the Reves Center, the University Registrar, the Office of Admissions, the Financial Aid Office, the Office of First Year Experience and WMSURE in order to welcome refugees to the College as students, staff and faculty members. Outreach policies designed for refugee and asylum-seeking students include creating a multilingual admissions webpage and the possibility of offering application fee waivers. The resolution also calls on the College to research potential scholarships specifically for refugees, such as the kinds offered by Brown University, Dartmouth College and Syracuse University. The resolution currently has over 300 signatures. The Senate passed the Rapid Flashing Beacon Act, which allocates $15,000 from the SA reserves to pay for two new flashing traffic beacons at the crosswalk near Campus Center and the crosswalk bordering Sorority Court. 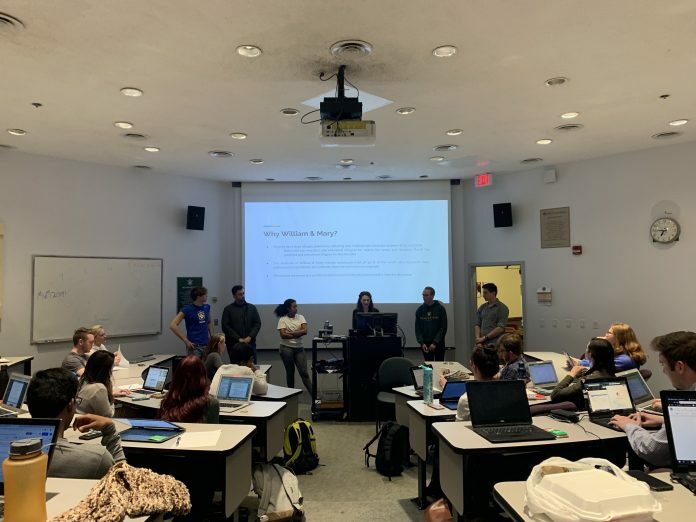 The Senate passed the Constitutional Omnibus Amendment of 2019 sponsored by Sen. Hailey Guerra D. ’19, Sen. Jack Bowden ’19 and Sen. Anthony Joseph ’21, which clarified discrepancies found between SA’s Constitution and bills passed by previous senates. The bill also updated SA’s Constitution to include gender neutral pronouns. SA approved their budget for the 2019-2020 school year with friendly amendments to transfer $10,000 from AMP Collaborative Concert Fund to the SA Concert Fund and $50.00 from the AMP collaborative concert fund to the Minority Pre-Law for their Social with Professionals. Election Commission Chair Sarah Baker ’19 presented SA election data to the senate, stating that the 47 percent voter turnout rate was the highest turnout in recent years. The Senate introduced new bills that will be voted on at the April 2 meeting to improve SA election processes. The Fair Election Act seeks to provide transparency to the election process by making presidential election funding available to the student body. The Elections Listserv Use Act will standardize the use of Listservs when communicating to the student body and placing such communications under the purview of the Elections Commission. The Elections Commission Assurance Act aims to standardize the number of appointees to the Elections Commission, as it currently does not meet the standard of SA’s Constitution.